This is one of those regular posts I write that’s in serious need of some branding. Maybe I should call it … oh wait a minute, Nate already writes a list called Powerful Posts. Well, I’m sure I’ll figure out what to call this one of these days. The last time, I called it Leviathan Ran. And Other Free Associations. Catchy, isn’t it. Maybe it isn’t. Maybe it is. That post received a lot of traffic. Which, like Martin says, is a good reason to never stop experimenting. It’s a link post and it’s about bringing you some cool posts and ideas from around the web. But rather than just throwing out a list of links, I like to wrap a little blathering around them. I just haven’t figured out a common theme for doing this yet. Every time it’s different. Every time it’s like doing improv. I went with my cousin to Yuk-Yuk’s one time. It was his first time doing stand-up. He bombed miserably. It was so bad that people were laughing at how bad it was. Afterwards, we laughed at how bad it was. But that story should never stop you from trying something different. Which is why I wrote a guest post on Shoemoney about StumbleUpon the other day. Just to do something different. I like StumbleUpon. A lot. It’s a great place to find thought provoking stuff. There’s great stuff everywhere. Stuff from people like Penelope Trunk who tells you how to do something big with your blog. Or from Neil Patel, who makes a great point about doing something so simple and smart as linking to your contact page from your about page. There’s stuff to inspire you and motivate you. Anthony’s motivated. He’s just released his fourth WordPress theme. So that’s what this is. Stuff. At least that’s what I’m calling it. Hey just read your post on Shoemoney! Great one Shane! A while ago, when you told me about that stumble ads thing, I tried it, and it really rocks! I recieved a lot more than what i paid for. Although now I prefer “organic” traffic, obviously it costs less, and I usually get a lot more hits than if I had paid for it (ranging between 500 to 3000 a day). Just gotta know what to stumble, in what category, add the tags/keywords and also who stumbles it is important. I’m off to check out the other links you mentionned in your post! Yeah, I saw that post as well. I thought…..hey, I know that guy! Anyway, I’m just starting to learn how to use SU. I may throw a little $ in and see what happens. Maybe go the alliterative route? Something to do with the word “Share”? Maybe Friday’s Free- Association Stuff? StumbleUpon is definitely my social media site of choice. I don’t mind throwing a little cash at it once in awhile, just to lend a little support to a great site. It’s worth doing a little advertising there. I’ve only had one post rejected because I didn’t put it in the most appropriate category. I changed the category and it was good to go. Do a little stumbling and get a feel for what people are interested in first and I’m sure you’ll do great. I’m guessing quite a few people saw the Shoemoney post. I saw his open call the other night and jumped on it. It’s a great blog. I’ve gotten a lot of value from it. Jeremy’s podcast interviews are the best. haha … I was hoping I’d get some suggestions. 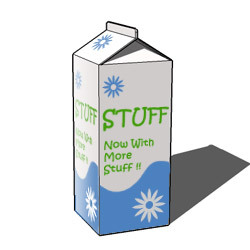 I think I’m gonna stay away from “stuff”. I actually got a great idea for branding it about 10 seconds after I hit publish … isn’t that the way it always happens! Keep up the great work here at Zoomstart!